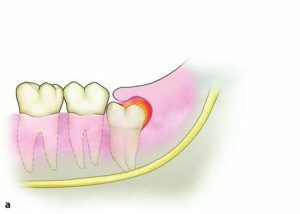 In the last blog, we discussed that Pericoronitis can be confused with Temporomandibular Joint Disorder (TMD). This may be a good time to brush up on the anatomy of the Temporomandibular Joint (TMJ) and on the subject of TMD. You can do this by reading the series of blogs on TMD, which were posted from October 12th, 2011 to November 12th 2011. .
– A swelling and tenderness around the operculum of a partially erupted wisdom tooth. – Associated with a bad taste in the mouth and accompanying bad breath. – The pain and discomfort often disturb one’s sleep. – Doesn’t respond well to analgesics. – The patient’s mouth opening may be limited. This is often the result of trismus. We will discuss this in a future blog. – A dull aching pain of the face, more specifically the angle of the jaw(masseter) muscle and inside of the mouth behind the upper wisdom tooth (lateral pterygoid muscle). – Headaches are common along with soreness in the temples, jaw and neck pain. – Rarely affects one’s sleep. – Usually responds to analgesics. – There is the possibility of limited mouth opening and trismus. One also often hears joint noises (clicking upon opening) and deviation of the mandible (jaw) to one side or the other upon opening. Whether TMD or Pericoronitis, it is important to not self-diagnose…better to see your dentist for a proper evaluation in order to determine what the actual problem is along with a suitable course of treatment.